Old Dutch Ketchup Chips, Baked vs. Fried — does the new kid meet the standard set by the snack-food legend? 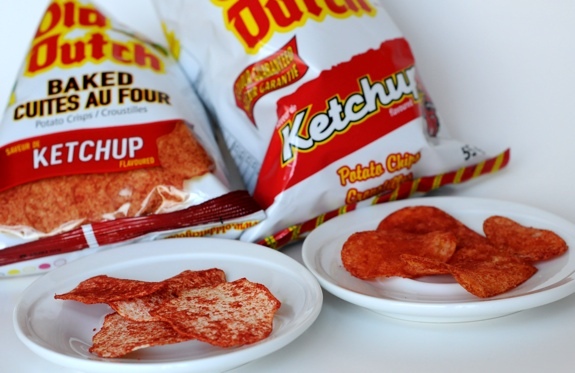 I don’t want to overstate this, but Old Dutch ketchup chips are a part of the Western Canadian cultural landscape. 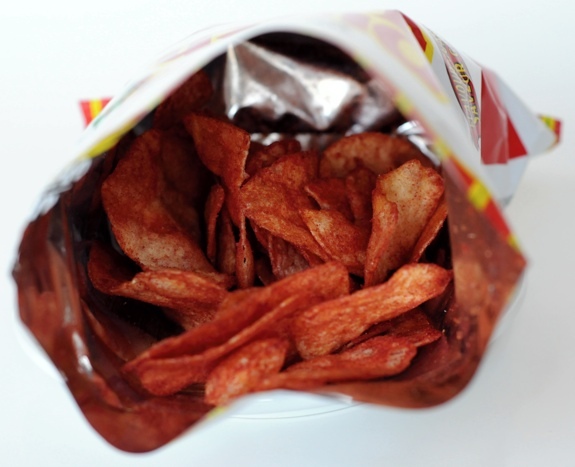 From hockey arena concession stands to convenience stores to transit-station vending machines, kids from this corner of the globe know and love ketchup chips in general, and Old Dutch ketchup chips in particular. If you’ve never had them, it’s sort of like eating a salty/sweet/crunchy version of French fries smothered in powdered ketchup. Chip purists may scoff, but they’re ridiculously delicious. They also make your fingertips red. A whole generation of ketchup-chip-eating kids has now moved on to adulthood, acquiring more sensible eating habits along the way. Chip makers, no doubt keen to keep up with food trends, have started to produce baked versions of their fried chip flavours, a health-minded experiment with results that vary from awful to not too bad. 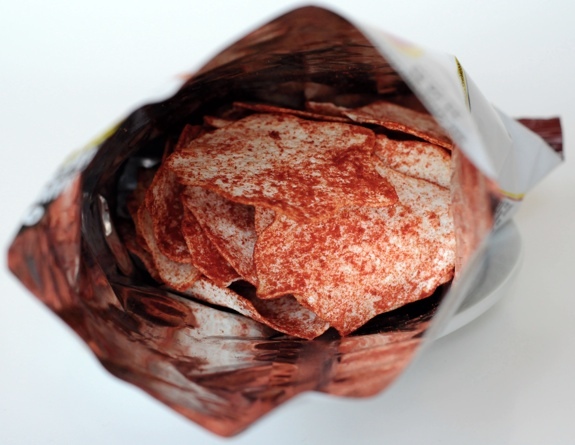 Baked Old Dutch Ketchup Chips — white potato mush base, speckled with red flavour crystals. Well, colour me surprised. Old Dutch Baked Ketchup Chips are actually pretty darn good, even though there are plenty of differences between them and their fried cousin. Let’s compare and contrast, then. The look: Shapes and sizes vary with each standard fried chip, while the baked ones are made of dehydrated potato mush formed into a uniform-looking shape. The seasoning is a more vivid shade of red on the baked chips, while the fried ones have a muted yellowish glow from the frying. The baked ones look healthier. The texture: Very different between baked and fried. Baked is crunchy and crisp, and gives a harder snap between your teeth. It takes a bit of work to turn it into mush, and it doesn’t feel greasy at all. The fried chips are much softer and feel different in the mouth. The texture varies with every chip, as they’re made from real slices of potato, not dehydrated potato product. The seasoning: Just as good on either version of the chip. On the baked chips, the seasoning overpowers the potato flavour. The overall taste: It’s hard to describe, but the fried chips taste more like potatoes, while the baked chips taste more like the seasoning. These are, without a doubt, the best baked chips I’ve ever had. Fried Old Dutch Ketchup Chips — the original finger-staining snack, beloved by young Winnipeggers. Cost: About $1.30 for the fried chips and $1.50 for the baked. I bought them at different places, so the price difference may be store-related. Prices seem to vary widely for both. We’ll call it about equal. Value for cash money: Excellent. Availability: Fried variety is ubiquitous in Western Canada. Baked version availability is limited, but growing quickly. It’s considerably easier to find large bags of Old Dutch Baked Ketchup Chips than the smaller 55-gram size. Country of origin? : Fried seems to be from Canada, while the baked variety clearly states Product of USA. Any luck finding these south of the border, American friends? 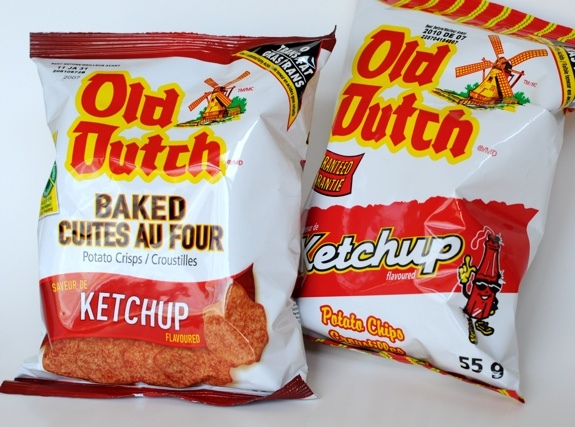 The verdict: Old Dutch ketchup chips are a standard Western Canadian comfort food, and they could have screwed up a perfectly good thing when they made a baked version. But the baked chips are actually really good, and, more important than the calorie count, they don’t make my hands (and keyboard) as greasy as their fried brothers. More than happy to recommend giving these a try. The fried ketchup chips have a deep reddish-yellow glow to them. I’ve alway been a fan of old dutch ketchup chips and I recently ate the bake ones..I LOVE THEM BOTH!